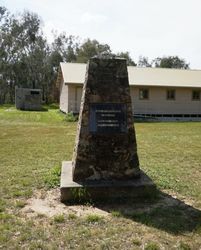 A cairn commemorates the Major Thomas Mitchell expedition which passed through the area in 1836. Messrs. Charles Daley, secretary, F Hansford, C. R. Long, V. H. Miller and Mrs. Miller, of the historical memorial committee attended the unveiling of a cairn near the foot of Mount Ochteryre, Gooramadda, indicating the place where Major Mitchell the explorer, camped on 18th October 1836, before crossing the Murray, on his return journey to New South Wales. The unveiling was performed by Dr. J. R. Harris, M.L.C. The site of the cairn is beside a new main road constructed under the Country Roads Board, from Howlong to Barnnwartha, costing £2450. 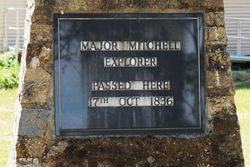 Mr. Daley in his speech, traced Major Mitchell's route through Victoria, stating that the cairn indicated where the explorer last camped in Victoria, and was the twenty-fifth cairn erected along the route. He thanked the Rutherglen Shire and residents of Gooramadda for erectlng the cairn. After the ceremony, the new road adjoining was declared opened. Mr Daley, representing the Country Roads Board, congratulated Engineer Lingford on the manner in which the work was carried out. Mrs. Morris, wife of Cr. O. H. Morris, then cut the blue ribbon that stretched across the road. and declared it open for traffic. Corowa Free Press (NSW), 18 November 1930.